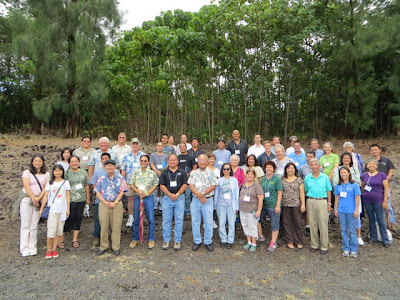 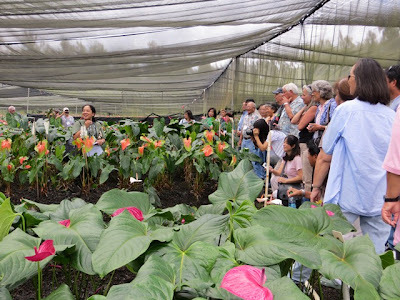 The University of Hawai’i at Manoa’s College of Tropical Agriculture and Human Resources (CTAHR) and the USDA Risk Management Agency (RMA) sponsored the 2012 Hawai’i Floriculture Risk Management School – Floriculture Symposium and Farm Tours on July 24 – 25, in Hilo, Hawai’i. 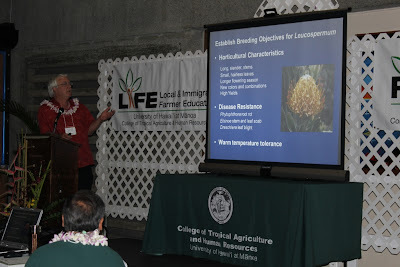 Day 1 took place at the University of Hawai’i at Hilo’s Campus Dining Room and included 16 presentations. These presentations included: Mr. Eric Tanouye, President of Hawai’i Floriculture and Nursery Association, Dr. Tessie Amore with an update on UH Anthurium and Dendrobium Breeding Program, Mr. Kelvin Sewake on Chemical Controls for Burrowing Nematodes on Anthuriums and Foliar Nematodes on Oncidiums and Dr. Janice Uchida on Fungal Diseases of Ornamental Crops and Potential Management Strategies, as well as many other research updates. 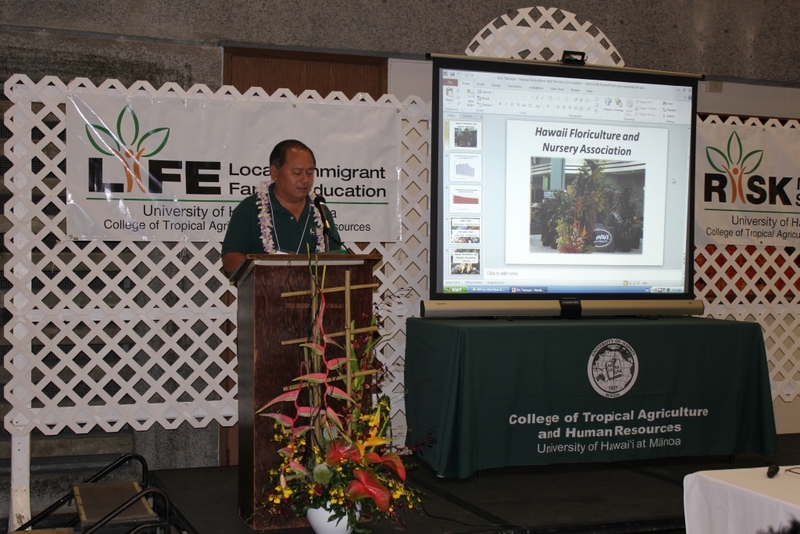 Team LIFE member, welcomes the 103 participants to the symposium. Dr. Kenneth Leohardt, UH Manoa CTAHR Extension Specialist, discusses his work on warm temperature tolerant proteas. Participants enjoyed the symposium and gained new information. 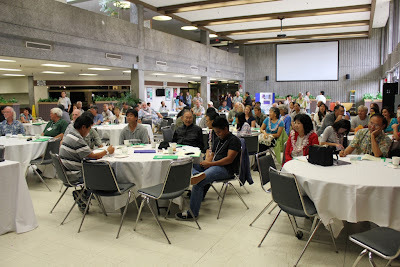 Evaluation indicated that participants learned zero (2%), 1 to 2 (11%), 3 to 4 (27%), 5 to 9 (48%), or 10 or more things (13%) that could be applicable to their risk management operations. Participants also benefitted by the opportunity to interact with each other. Farm tour participants stopped at Greenpoint Nurseries, Inc. to view anthurium production, and the processing and packing of other cut tropical flowers and a wide variety of cut foliage.